Think your 50 inch Plasma with Xbox gives you the most immersive gaming experience? think again. 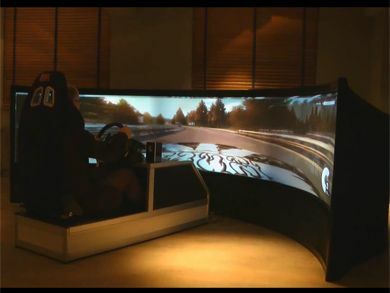 Swedish company is offering a whooping a 160-inch, 175-degree curved screen with a unique Formula 1 simulator which might be the closest most people will ever get to driving the real thing. Swedish company Norman Design is offering a very intriguing Formula 1 simulator unlike any we have ever encountered. The design was developed for training prepuces for professional Formula 1 drivers and it comes with the screen as well as the drivers chair and full system including a powerful computer capable of running a specially designed software that can display content on the entire 160 inch curved screen. Not much is known about the display itself although Norman Design claims it is "portable" weighing only 110-pound and could be assembled almost anywhere in about an hour. Buying the Formula 1 simulator with the display should set you back around 114,000 dollars however if you only like the display itself you will only need to pay around 28,500 dollars and the company does offer leasing options. More information can be found on the Norman Design website. Super large monitors and even curved monitors are actually nothing new. They start from tiny flexible displays such as the one displayed by HP a few years back and go up to the Alienware 42.4-inch curved CRVD-42DWX monitor we saw on CES 2008. The show apparently also hosted a gigantic 150" screen (non-curved) but unlike the Norman Design it had a much more conventional design meant to watch movies and not play immersive games.